One of the best places for sunset for sure. A ‘must do’ if you are only on Phangan for a few days. They have a large comfortable seating area with thai cushions to relax on and enjoy the high views at sunset. 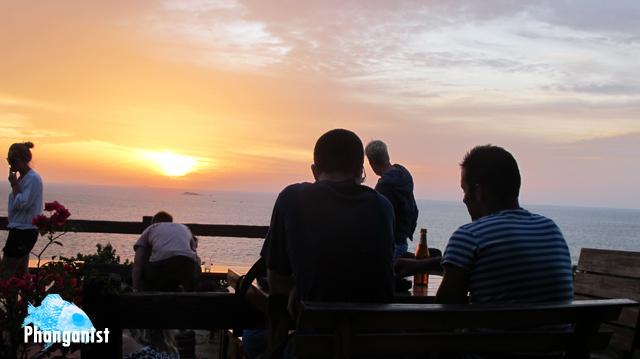 A beautiful place next to Sri Thanu pier makes Phangan Cove a great place for sunset. The pier and bay itself is beautiful, the sea is usually flat and there’s no hills around, it’s a plain so you can see a lot of it. When the light hits the water the reflection is very big and surreal, it has the look of a painting. On Ban Tai beach this spot is especially nice if they are playing music. Grab a nice cocktail from Beach Village’s Tiki Bar and enjoy the view over to Samui to watch a spectacular sunset whilst the local thai’s collect shellfish in the shallow water. Great for a sunset as you can see the neighbouring island in front and you have a stereotypical island swing hanging off of a lazy palm tree to chill on. Just a nice relaxing wooden bar and although it is on the ‘Sunrise’ side of the island, sunset seems to work really well there. A very quiet place if you sit on the beach outside the resort. It is also dog friendly as there is a pack of dogs that live there but they’re chillin. Friendly staff at the bar if you want to get a drink as well. Probably one of the best places to enjoy sunset and they have happy hour from 4 - 6pm. For many of us locals that don’t normally get to enjoy such a luxurious setting the two for one offer makes it a worthwhile investment for sunset. Just before you go down the hill to Secret Beach there is a place to stop on the left side but it is narrow so be careful to bike the bike well. You can see a mile or two in front of you and you are very high up, it’s a peak in the hill. An amazing view of sunset.